The summer school will explore how the representation of the body and its functions changed from antiquity to the early modern period and how technology altered the perception of what we are as human animals. By adopting three of the most iconic analogies ever used in the history of medicine to represent the human body, The Kiln, the Alembic, and the Clockwork will explore the early modern imagery of the body, in connection to the methods of investigation and its overlapping with disciplines such as alchemy and astronomy. 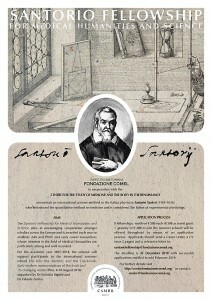 Particular attention will be devoted to processes such as the combination and the concoction of humours (the kiln), distillation and perspiration (the alembic) and the mechanical action of innate heat (the clockwork) whilst considering, for each analogy, the visual impact it exerted on the Renaissance and early modern representation of human physiology. The summer school is directed to undergraduates, postgraduates as well as PhDs wishing to deepen their knowledge of history of medicine and its connection to other disciplines of knowledge in the early modern period. Sources and papers will be pre-circulated in order for attendees to engage fruitfully in conversation with speakers in a roundtable at the end of the day. The Summer School will be held in the outstanding location of domvs comeliana in Piazza dei Miracoli (Pisa) with the provisional programme available here. The International Summer School runs along with the 2018 edition of the Santorio Fellowship for Medical Humanities and Science, which will be advertised separately. Selected winners will attend the Summer School for free and will receive a travel grant up to €300. Applicants must send a cover letter, a copy of their CV and a referee letter to santoriofellowship@fondazionecomel.org by the 31st December 2018. Winners will be notified in mid-February 2019. For information and details please contact Dr Fabrizio Bigotti at f.bigotti@exeter.ac.uk.